Take a sauce pan, fill it with water and put it on flame. Let the water boil. Now put another sauce pan inside the first one. Make sure the second sauce pan is smaller than the first one. Put the chopped or crushed old candles inside the second sauce pan and let it melt. Now add the wax color and mix properly until the liquid inside the pan becomes equally colored. Now add coconut oil and mix well. Keep it on flame while mixing. Take a wick, stick it on the bottom of the mold with the help of a tape. 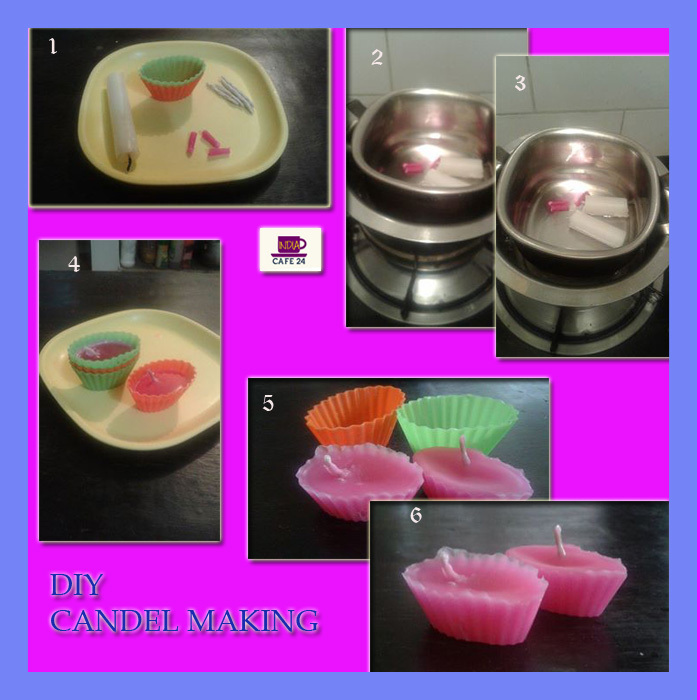 Keep the wick upright and pour the candle mixture inside the molds. Now let it cool and remove from the molds. Your home made candles are ready. You can decorate these candles with sparkles, colors to add the festive feel. I like plain and elegant look of candles so I am not decorating it. Perfect homemade gifts for friends and family for Diwali. This is a nice way to tell people that you care for them. These candles look beautiful and are unique gesture of your creativity.